Jarome Iginla's stall was empty and stripped of his nameplate Thursday. A Flame for all of his 16 seasons and the team's captain for nine, his departure left a void and questions about the future of the franchise. 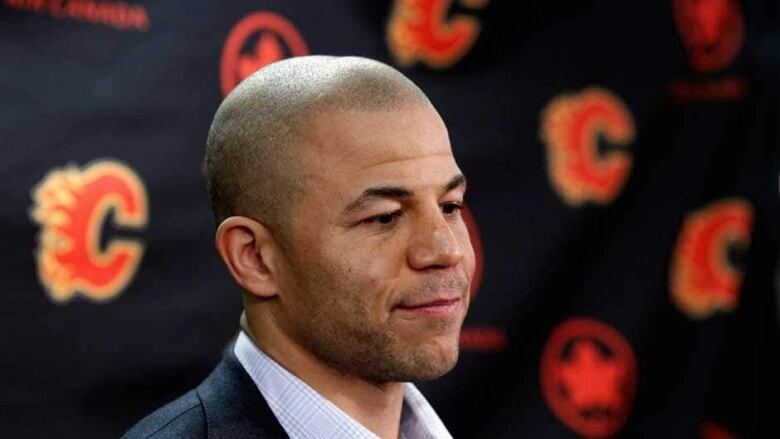 The Calgary Flames woke up to life without Jarome Iginla on Thursday. While Iginla sat out the previous night's game as his trade to the Pittsburgh Penguins was negotiated, his dressing room stall was still full of his equipment and bore his nameplate. His teammates were also preoccupied with beating Colorado, whether their captain was in the lineup or not. But Iginla's stall was empty and stripped of his nameplate Thursday. A Flame for all of his 16 seasons and the team's captain for nine, his departure left a void and questions about the future of the franchise. "It's weird. It's definitely weird," Flames forward Mike Cammalleri said. "There's no downplaying the significance and the presence he's been in the room, on this organization and in this city. It's a little different today." Iginla bid his teammates a hasty goodbye prior to a morning news conference at the Saddledome. The players' thoughts reflected that of many Calgarians and hockey fans. They're sad to see their captain go, but hope Iginla wins the Stanley Cup that has eluded him in Calgary. "It's a unique situation here, just because he's been here for so long and he really is the face of the franchise and done so many great things," defenceman Jay Bouwmeester said. "You play long enough, you see guys come and go. It doesn't mean you have ill-will or anything like that. "I think everyone in here wishes him the best of luck. It's a great opportunity for him." Calgary (13-15-4) is ranked 14th in the NHL's Western Conference. At six points outs, the Flames are not yet mathematically eliminated from playoff contention, but face a fourth straight season finishing out of the post-season. The urgency to turn the hockey club's fortunes around prompted the trading of the face of the franchise. "We're not where we want to be and unfortunately Iggy was the first guy to obviously get moved because of it this year and so you feel you're a bit responsible for it," defenceman Mark Giordano said. The Calgary ownership group hasn't traditionally held firesales, but if this is one, they started at the very top. Iginla waived his no-trade clause to facilitate the move to Pittsburgh and had a say in his destination. But general manager Jay Feaster hinted when he announced the deal with Pittsburgh for two college forwards and a first-round draft pick that he is not done on the trade front. He said weekend meetings with head coach Bob Hartley, assistant general manager John Wiesbrod and the Flames scouts will determine their strategy for the NHL's trade deadline next Wednesday. "I know you guys like the 'rebuild' word," Feaster said. "Our goal is we want to 'retool' to the point where we're a competitive team and a legitimate playoff team. "We're going to continue to look for ways to improve our hockey club. There are any numbers of ways to do that and that's through the draft, through trading and through free agency. We're going to avail ourselves of all of those avenues, but I don't want to use the 'rebuild' word. "I think we're going to be busy. We're going to be active in the process of trying to stockpile assets. We are not looking to move draft picks or prospects to get players right now." Lost in the trade speculation surrounding Iginla was the rumbling about the future of goaltender Mikka Kiprusoff in the organization. The 36-year-old has one year remaining after this season on a contract that counts $5.8 million annually against the salary cap. The no-trade clause in Kiprusoff's contract has expired, according to Capgeek.com. Sportsnet has reported that Kiprusoff would refuse a trade, but the goaltender would not address that report after Wednesday's game. "I'm not going to talk about it," Kiprusoff said. "I'm going to concentrate on playing games with the Flames here right now. I like it here a lot." Meanwhile, the Flames host the Columbus Blue Jackets on Friday and look to extend their winning streak at the Saddledome to nine. Road games have been their downfall this season with a team-record 10 consecutive losses. "In our business you find motivation in a lot of places," Cammalleri said. "Until someone actually tells me we're mathematically out of it, no one in this room will feel that way. "Guys are competing hard for their own livings as well. You don't throw in the towel as a player ever."